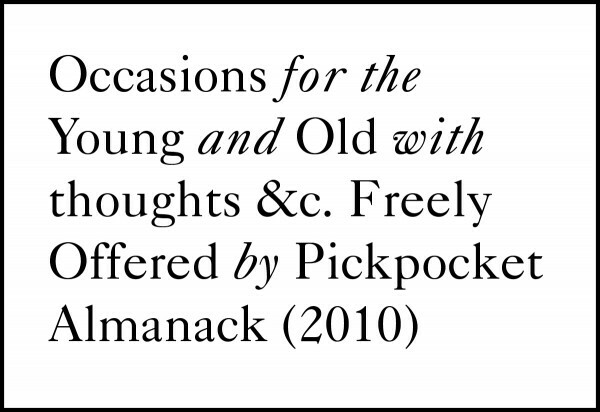 On the occasion of Pickpocket Almanack’s Fall Season, an email exchange between Joseph del Pesco and Sean Dockray just prior to a public conversation at Bétonsalon in Paris, France, about the Pickpocket Almanack and The Public School. Sean Dockray: Mainly I’ve been trying to think about how the projects could weave into each other a bit, instead of being like Coke and Pepsi; but how our thoughts and the projects could cohere and illustrate the world around, how they can remain distinct on the one hand but also how we can make something together (an argument, a discussion as project, etc.) that is deeply interdependent. I was also thinking before about technically integrating things, and really, the technical affordances are already there … you can do PA inside TPS structure and PA discussions could use TPS for improvising discussions. We don’t need to over-code it. What’s more interesting to me is integrating their ideas through discursive formats instead. Joseph del Pesco: Yes, I like your proposal for discursive entanglement and of, perhaps more functionally, the pages of PA interleaved within TPS. While TPS and PA both remain discrete programs in this experimental iteration in Paris, they are conceptually and programmatically overlapping and perhaps in the process are able to highlight their implicit values and attitudes via compare/contrast. One point of integration is how PA will be borrowing the open-ended invitation to submit a class that comes with TPS. When we first started Pickpocket Almanack last year, Dominic Willsdon and I had the thought that in addition to working with the five faculty, who select existing public events in the city, we would publish the “master calendar” that we collect at the beginning of each season on the website and invite anyone and everyone to make their own selection. We would publish this like a text, rather than an active course one could sign up for on the website. So, this opportunity to sort of go back in time and try that out has been a keenly appealing aspect of mixing with TPS in Paris. I’ve long loved the porous and egalitarian spirit of TPS, and how it embeds or acknowledges the conflict inherent in a decision-making process. It’s not just an art organization, it’s also a model of an agonistic democracy. The relationship to power structures is very thoughtful, and the commitment to a continual process of de-institutionalization and intellectual promiscuity is much closer to artist practice than most nonprofit orgs, which have (in many cases) become overly professionalized and bureaucratic. The relative autonomy of TPS is very different than the parasitic relationship of PA to the institutions it culls events from, and even to some extent to SFMOMA. While PA is promoted and funded by SFMOMA, it isn’t physically hosted at the institution and doesn’t have any pressures or mandates to, say, include SFMOMA events in the course selections. Of course, the faculty often do anyway. SD: I remember appreciating the apparent ease of Pickpocket Almanack when you first told me what you were planning. Although there is work involved (in setting up the website; in establishing the funding relationship with host institutions; in finding faculty, generating the master calendar, handling signup logistics, and so on), PA seems quite effortless: there are so many cultural events around a city, almost too many, so why not recontextualize these existing ones instead of adding more. 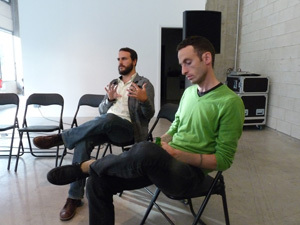 This conservational impulse can be seen throughout the internet, on sharing sites like delicious or tumblr or FFFFOUND!, and the impulse in itself could be a response to the internet at some level: with so much information available, means of sorting and prioritizing what’s there becomes just as useful and generative as producing new information. JdP: Yes, I don’t see the parasitic relationship as necessarily one-sided or “bloodsucking,” but mutual; parasites have evolved to contribute something back to their hosts. That or they get scraped off. I often think of our activity as closer to identifying and exploiting a kind of surplus; a result of too many amazing lectures, and workshops and screenings (etc. ), more than any one person could attend to. The idea came from an observation that some of the best universities in the country (like Berkeley and Stanford) and top-tier art schools (like CCA and SFAI) had these incredible public lecture series, and that they were all free! That if you added those up and started to develop a kind of narrative to connect them, to build some momentum and coherence, it might approximate a free school. I’m reminded of a quote from the technology writer Clay Shirky, “Because if people knew what to do with a surplus with reference to the existing social institutions, then it wouldn’t be a surplus, would it? It’s precisely when no one has any idea how to deploy something that people have to start experimenting with it, in order for the surplus to get integrated, and the course of that integration can transform society.” He’s talking about projects like Wikipedia, and other ways to leverage an individual’s cognitive surplus to our collective advantage. As you know, I think about programs like PA and TPS as algorithms, complex conditional structures that allow for creative freedom within a kind of conceptual scaffolding … and so your comparison to web-based aggregators is a fitting one. I’m interested in how small or isolated expressions of intelligence can be compiled or networked to yield large-scale effects. But back to TPS for a moment, the distribution of the program; that there are multiple “charters” in other states and nations is an unusual feature of the program, and one that suggests a shareware-like reproducibility and also a process of translation as its structure is inflected in different cultures. This is the first time PA has “traveled” beyond the San Francisco Bay Area, but it’s not the only time it will do so this year. I wonder what kind of shifts and mutations have occurred in the process of deploying TPS. SD: As a form, TPS is more like a plant or an organism than it is like a building, so the idea of mutations is pretty appropriate. To extend the metaphor of the plant: genetically identical seeds will produce remarkably different trees simply as a consequence of soil conditions, the amount of water and sunshine, pruning, insects, rare diseases floating around, and so on; likewise, TPS always begins from the same software and concept but always manifests itself in different ways. 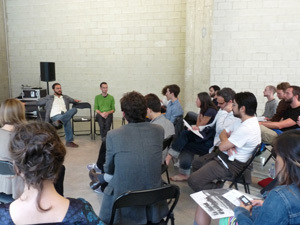 Variations appear in the number of classes, how many times they meet, whether they are lecture-oriented or not, how many people show up, a focus on art or a decision to ignore discipline, whether classes lead to new class proposals, how much classes are shaped in between the time that they are proposed and the time they are offered, whether class proposals are in the form of a question or an answer, etc. So much of what each school is depends on the place it is located, which takes me back, actually, to your earlier point. A particular city’s people have so many interests, skills, forms of knowledge, and desires that some might call this a surplus. This surplus is captured by the existing institutions of entertainment and work, which I think Shirky is getting at, and our attention is turned into profit for somebody — i.e., logging in to Facebook might amount to a form of unpaid labor. So maybe there is radical potential in routing these talents and questions and curiosities into new cultural projects, out of and away from the proliferation of lifestyle niches and towards a new public space. In the same way, TPS as “a school with no curriculum” is not describing an empty space waiting to be filled but an uncharted territory. 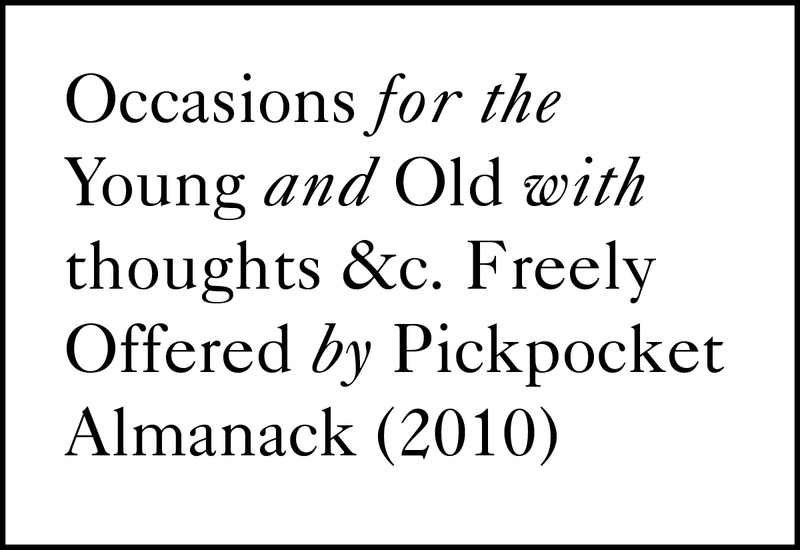 I’m wondering if you could expand more on what the essence of Pickpocket Almanack is for you. What I mean is that I could look at an events calendar and decide which things to go to in Los Angeles … and this is something I do … but it wouldn’t really make the project, even partially. To me it seems like the fact that I would have other coconspirators in the audience — who have the same external agenda as me — would be the moment when a Pickpocket Almanack is happening. Do you agree, or is it something else for you? If a city were to become a city full of cultural pickpockets, what would that mean? Or is the project more about the faculty’s curatorial choices? JdP: Well, let’s imagine someone taking their time on a Sunday morning, sipping coffee and reading through what everyone agrees is the best “events calendar.” This someone takes maybe two or three hours to carefully make selections for the next two or three months. This is probably a best-case scenario, in that it assumes that an individual would give this much time to designing their own experience. It also assumes that most everything shows up on the events calendar, which is, of course, not the case. Then there’s the fact that this someone is going to run into a lot of unfamiliar information, names of presenters from distant cities, music groups they’ve never heard of, films they can’t find a preview for. I’d say it’s unreasonable to expect that this person will be able to make informed decisions about what’s being offered to them. And I would argue that it’s often the people, ideas, films, and texts that are unfamiliar that are the most thrilling to discover, that expand our idea of the world, that contribute to our individual growth. For this we often rely on trusted friends and colleagues to offer suggestions, we want them to surprise us. The faculty in PA function along these lines, and offer a depth of knowledge in a given field. They’re a bit like tour guides, talking participants through the process of events in a series, and offering alternative or meta narratives to the ones provided by each venue. By offering a story they transform fragments into something that can build and connect. And then, yes, there’s a kind of social cloud that forms around a course, a group of participants aligning their schedules and developing conversations via email groups. We’ve been calling PA a “social encounter with knowledge,” which suggests an informal, maybe even casual process of learning. It also comes out of our way of working past the “school-without-walls” metaphor that we started with. We knew that the PA structure was strange and therefore kind of confusing, and that we needed to offer a familiar comparison, but even from the beginning we avoided language associated with school and education. TPS does the extreme opposite, using the language of school in a direct but also very general sense. In other words, “public” is a category or type of school, and “public school” means certain things to us in the U.S.: that it’s free, that it’s open to anyone. So when it becomes the name of the school, the word “public” starts to do something else … its meaning shifts. What are your thoughts about school and the “public” in TPS? SD: Originally, “public” simply meant that the curriculum was developed in plain view: it was drawn from proposals that anyone could make; and all inclusions, exclusions, value judgments and ethical positions were performed in public. Normally, whether in the domain of educational institutions or in art institutions, the “programming” is done prior to its existence in public — it is delivered as a finished calendar. The idea of having “no curriculum” is precisely to make the production of that calendar a matter of common concern. It’s not just that anyone can come to classes, or even that anyone can propose them; the whole body of students, teachers, and administrators are regularly swapping roles and the entire composition of the “institution” is constantly being rewritten. As you said, “public schools” in this country emphasize accessibility, but we also understand that the “public” in its name has nothing to do with its form, but is inherited from the school’s relationship to the state. TPS has nothing to do with the state, it is not about the reclamation of some lost public ,but the invention of new ones.